In this website I make claims about being able to purchase autonomous fleet vehicles for $12K or $25K apiece in the coming decades, which may seem ridiculous when the most common LIDaR (Light Detecting and Ranging)1 unit used in many of the original prototype vehicles costs $75K2 alone! It’s easy to be skeptical, but let me walk through an analysis of why those $12K or $25K price points aren’t ridiculous. First of all when I postulate a $12K autonomous vehicle, I’m talking about a Cabin Commuter rather than a full size vehicle. Also, recall that I’m talking about the mature market for autonomous vehicles twenty or more years in the future where vehicle architecture and manufacturing reflect consumer usage, which means that 75% of all vehicles being manufactured are going to be small, single person Cabin Commuters. The reality is that autonomous technology is going to decimate car sales in the industrialized world and cause the market for wheeled transportation to explode in the developing world, but that’s decades away and the extent to which it will happen is somewhat speculative so I’m going to analyze this in terms of the current automotive market for simplicity. I’m also going to use 2016 dollars for simplicity. The global automotive industry manufactures about 80 million cars per year right now, and if Cabin Commuters are 75% of that market in the future then that means we’ll be manufacturing 60 million Cabin Commuters per year. This means the industry is building around 5 million each Cabin Commuters every month spread across a dozen or more major automobile manufacturers. With that economy of scale, amazing things start to happen. Now I realize people may be more subjectively familiar with gasoline vehicle prices so let me start there. If this small Cabin Commuter platform was a combustion powered vehicle and Toyota, VW or whomever was 1) manufacturing half a million of them per year, 2) the vehicle weighed less than one thousand pounds, 3) it was legally a motorcycle so consequently not beholden to the majority of automotive regulations and 4) it was a fleet vehicle, analogous to a taxicab rather than a consumer product that was intended for sale to private customers, it’s easy to imagine that they could get the price down to around six or eight thousand dollars per unit. Right now electric vehicles are more expensive than their gas counterparts, but there should be a heavy emphasis on right now in that statement. Keep in mind the global auto industry manufactures about eighty million gasoline engines every 12 months but even if one includes hybrid vehicles, which far outsell pure electrics, electric vehicle sales are only about 700K units3 per year globally so we’re only manufacturing 700K EV battery units annually, most of which are small hybrid battery packs. Imagine a day when those ratios are reversed and we’re selling 79 million EVs and less than a million gasoline vehicles and keep the following in perspective. Right now everyone’s excited about Tesla building a Gigafactory in Nevada to manufacture enormous quantities of cost-effective batteries. That is pretty exciting, but by the time we need to manufacture 60 million Cabin Commuters per year and 79 million electric vehicles per year, there’s not going to be one Gigafactory in Nevada, there’s going to be hundreds of Terafactories all around the world. Again, the economy of scale will be overwhelming. The lesson is that the higher purchase price that electric vehicles are currently saddled with won’t last once we enter those production levels and benefit from that economy of scale. If the unit price for the automotive package of each autonomous Cabin Commuter is six to eight thousand dollars, then that means we still have 50%-33% of the budget of the entire cost of the vehicle just to pay for the autonomous tech. That’s pretty significant. Also consider this possibility. All autonomous tech basically boils down to the following: There are several pieces of hardware that emit electromagnetic radiation (radar, LIDaR, ultrasound, etc) into the environment and then read and measure the return signals. Other pieces of hardware only take electromagnetic radiation in without emitting it (video, GPS). Processing power then analyzes all those electromagnetic returns and creates a virtual map of the environment that the vehicles then use to navigate within the environment. A graphic representation of the virtual data map looks like this. This virtual map is what the vehicles need to navigate, and the map should be universal among all the cars inhabiting that traffic ecosystem. Since they all need access to the same map, consider the possibility that in crowded environments where there are lots of cars it may not be necessary for every vehicle to be independently, redundantly observing and creating the same virtual map with its own hardware/software suite. What if the vehicles could digitally share a common virtual environmental map that was produced by only some of the vehicles? 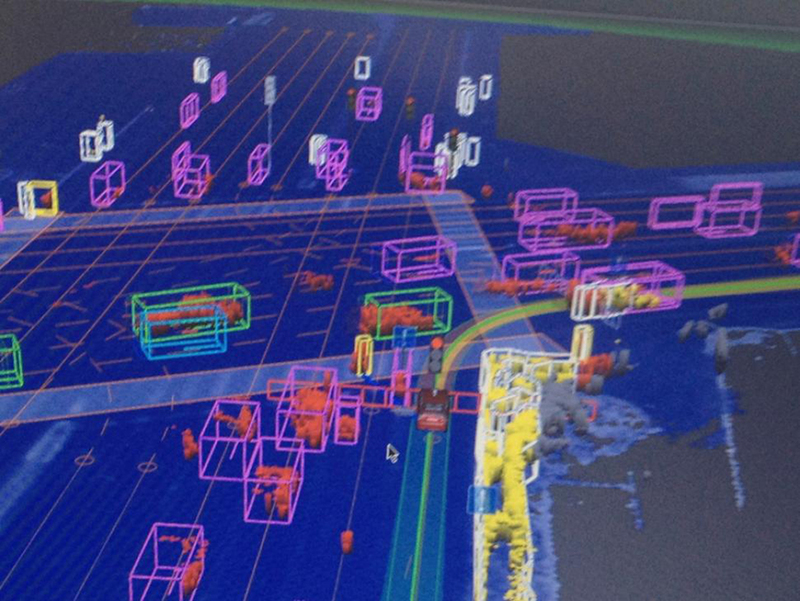 What if in the middle of a city where there are hundreds of vehicles within a hundred yard radius only every other vehicle needed to have the hardware/software capability to create the virtual map? What if it was only every fifth car? What if it was every tenth car and the rest of the vehicles could all just receive the virtual map through networking technology? What if only every twentieth vehicle required the full electronics suite? etc. It would be highly speculative to suggest what that number is right now but if only every fifth vehicle needed to have the full autonomous suite, the effect of that would be that even if the full autonomous suite never dropped below $25K, the effective per unit cost of the autonomous suite would drop to $5K per vehicle, which is really very inexpensive. All that being said, I think the autonomous suite will easily get below $25K in the coming decades. A recent study from Boston Consulting Group4 predicts that in a decade or so a full autonomous suite in a vehicle may cost perhaps $10,000 on top of the price of the vehicle itself. 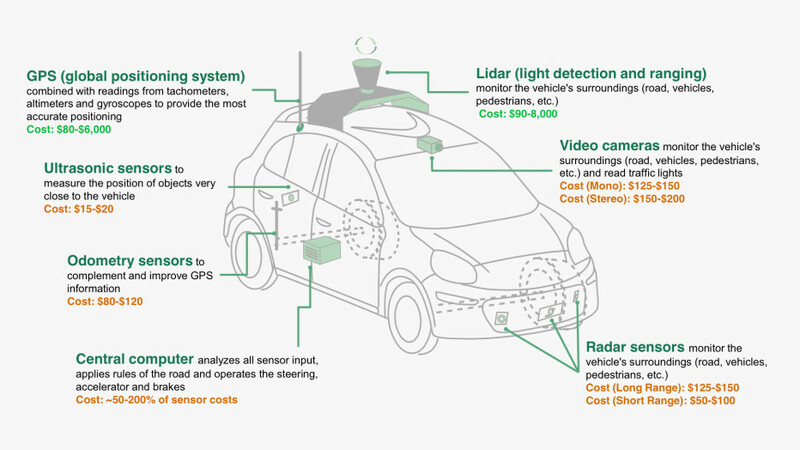 This is an infograph from a report done by Boston Consulting Group that shows the price range of the various hardware items required to control an autonomous vehicle. Most of the hardware described is no more than tens or hundreds of dollars. The three big ticket items are 1) the LIDaR, 2) the high resolution GPS and 3) central processing power. To get a better understanding of how these price points might come down let’s look at the LIDaR hardware as an illustrative example. As mentioned above, the 64 channel unit that most of the early autonomous vehicle prototypes were using cost about $75K. That’s not much to a mining company that routinely buys $5 million dollar mining trucks by the dozen, but it’s two or three times as expensive as a sedan marketed to the middle class in America, so that price point is completely out of the question for mass produced, commercially available autonomous vehicles intended to be sold to the middle class in America. 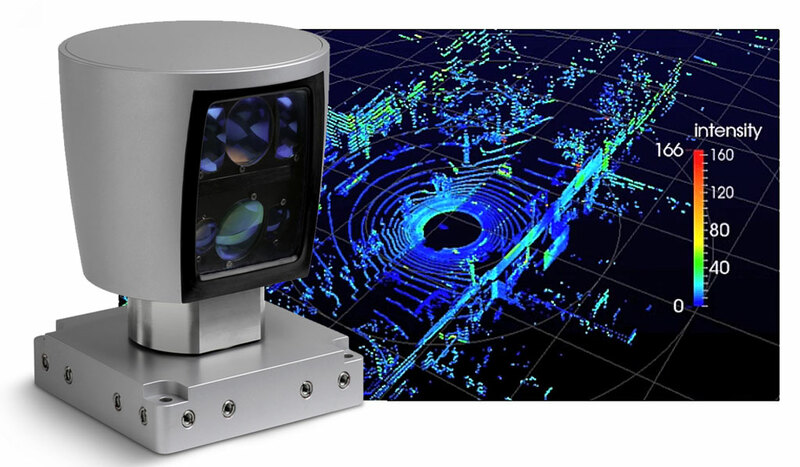 In 2014, Velodyne released a 16 channel LIDaR puck5 unit that costs about $8000, which constitutes an order of magnitude price reduction, but is still too expensive to put on a $25,000 sedan. In early 2016 Quanergy announced6 that they had developed a solid state LIDaR that could produce a million environmental data points per second that would only cost $250. the device only has a 120 degree field of view so it would likely require mounting three units on any autonomous vehicle, but regardless, $750 for three sensors is another order of magnitude decrease in the price of one of the most expensive pieces of autonomous vehicle hardware. This, folks, is how autonomous vehicle technology becomes cheap over time. To suggest the price point isn’t going to eventually plummet is to ignore the entire history of technology, Moore’s Law and the fundamental reality of exponential development and growth.